Do you like slashing fruits? This is a NEW funny way to do it! 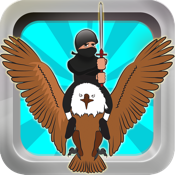 You are a ninja flying on your eagle in the middle of amazing islands. Suddenly, the giant fruits have gone crazy! DRIVE your eagle and SLASH'EM ALL trough this addictive fruit game. - Incredibly fun, endless game play! Get this game while it is FREE! And don’t forget to rate us and tell us what you think.